These days, it is very important for the project managers to track the progress of the project plan so that they will know what areas needed to improve. This is the reason why project managers develop a scope statement. This will help them throughout the project. However, scope statement can be quite complicated to write. Fortunately, this article offers scope statement examples that you can download to lessen your burden. 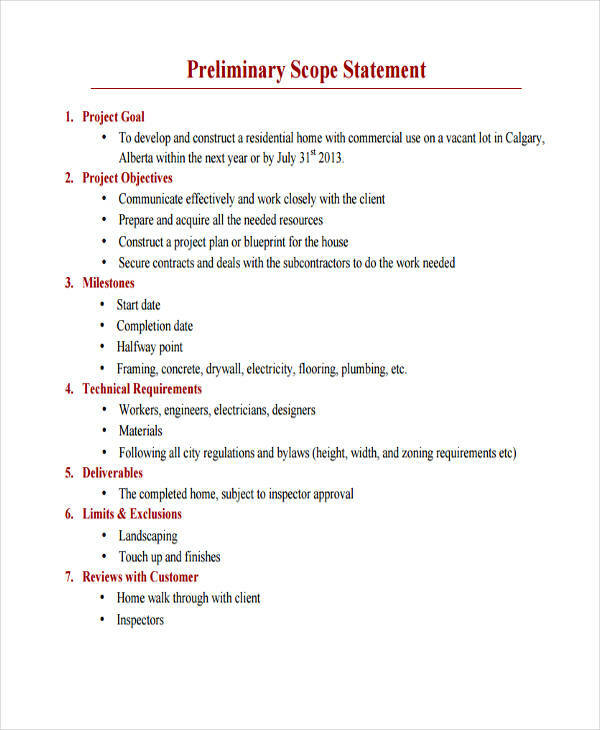 A scope statement sometimes differs depending on the project. Commonly, scope statement has two terms – the project scope statement and the product scope statement. These two are different from each other but they only shared the same goal for the project and that is, to become a success. This is also the project managers personal vision statement. What Is a Product Scope Statement? A product scope statement refers to the details, characteristics, and features of the product. If the product scope statement defines the product in terms of the goods, it answers the question, how the product is made, what the product looks like and what would the product do. You may also see need statement examples & samples. Product scope statement does not necessarily refer to a tangible product. 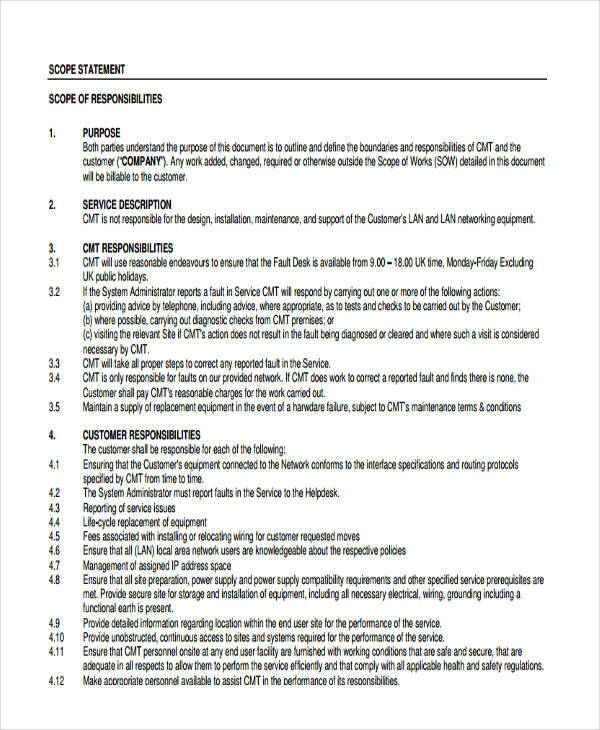 If the product scope statement refers to the product in terms of a service or other forms of output, the project scope focuses on how the task or service is performed and delivered by the personnel who is responsible. 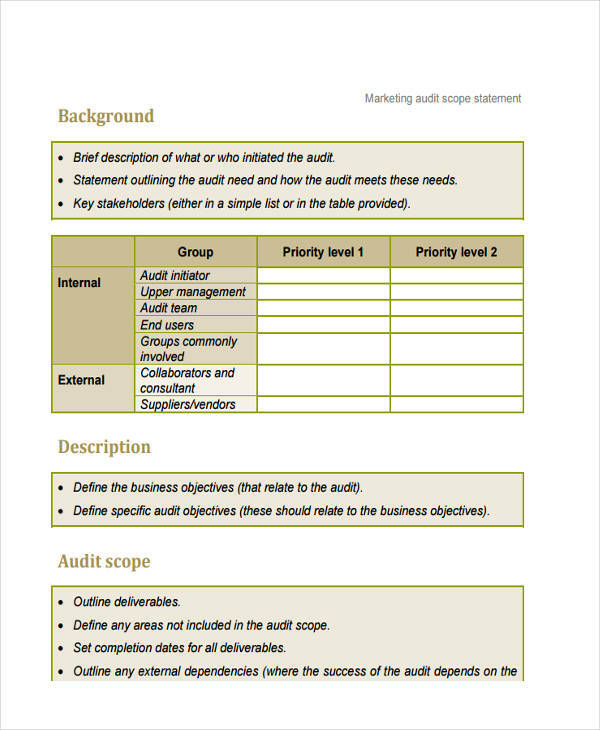 You may also like statement of work examples & samples. 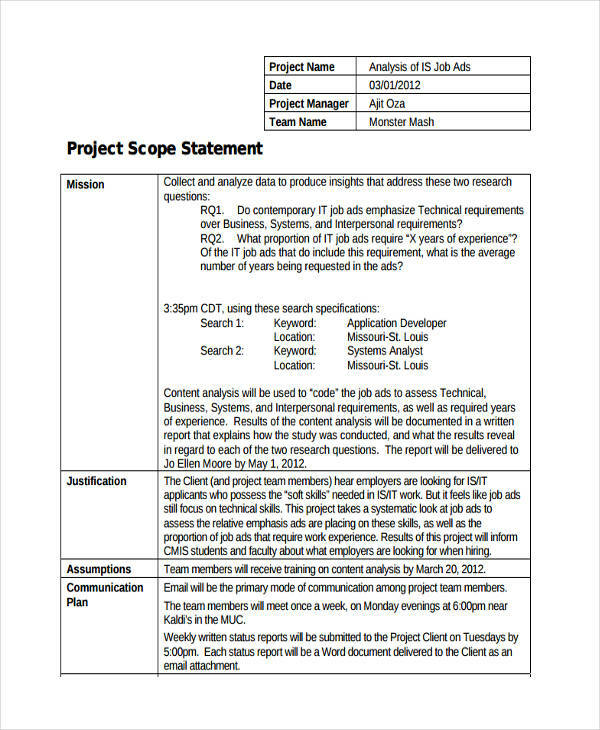 What to Include in Project Scope Statement? Unlike product scope statement, project scope statement focuses on what the project is all about. It defines the work process, the employee statement, and various steps that are needed in a production of tangible products or how the service is provided. Justification. 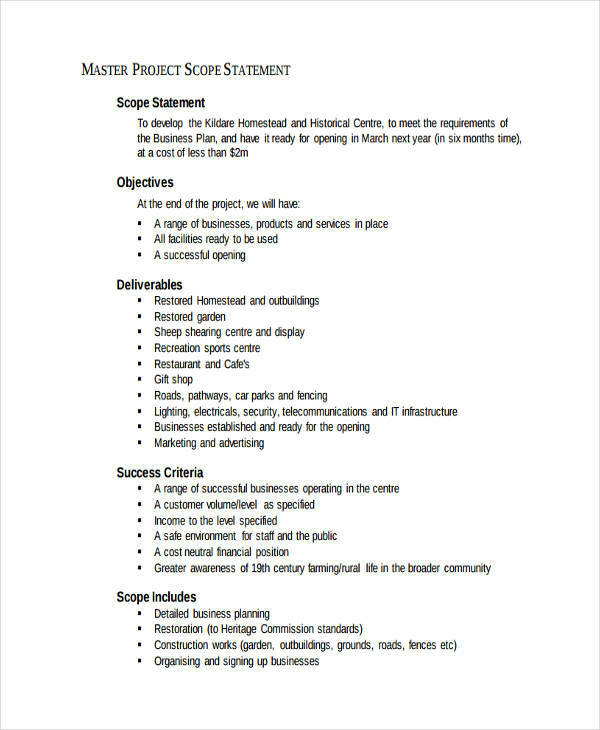 The summary of the project proposal. Product Scope Description. The component of the product or services provided. Criteria. 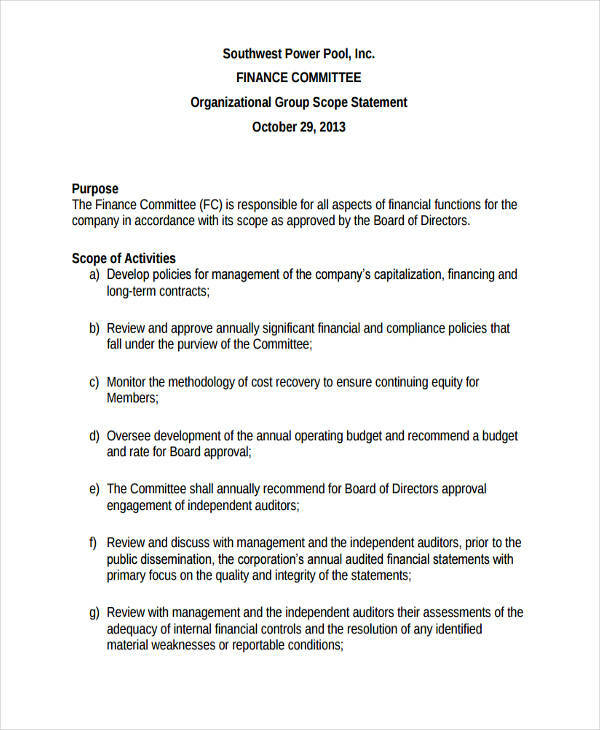 The conditions that need to be reached in order for the project to be accepted. Deliverables. The output of the project. Project Exclusions. The things that are not part of the project. Constraints. The limitations and restrictions of the project. Assumptions. 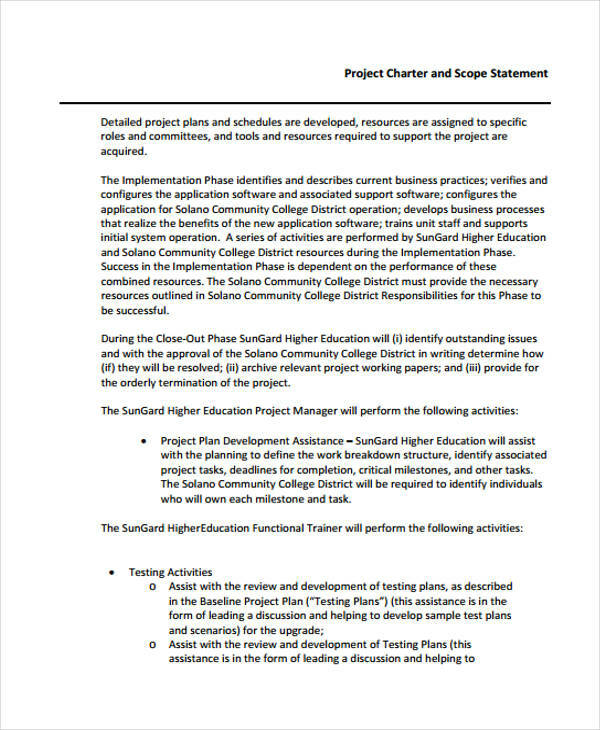 Statements of an uncertain action plan in the project. What Qualities Should Scope Statement Have? A scope statement, whether it is a product or project scope statement is very important in any project proposal or any research statement. This is because scope statement details the goals and objectives and the possible output that leads to a successful project. Every project manager should keep in mind the qualities of an effective scope statement. 1. Scope statement should be clear and concise. It should determine what the project consist and what are not part of the project. 2. Scope statement should have a Smart goals. This means that a project should be specific, measurable, agreed upon, realistic and timely for it to be successful. 3. And lastly, scope statement should not only define the scope. Scope statement should also have important information such as the goals and objectives, the team name, and start and end dates. How to Develop a Scope Statement? Writing a scope statement is very daunting as writing an income statement for project managers because they know that a scope statement is quite tricky and complicated to write. However, project managers know that a scope statement is one of the most important documents in a project plan that is why it’s very important for project managers to develop a scope statement. The project’s needs and problems. The project’s objective statement including the statement on how to solve the project’s problem. The benefits of the project and why this project should be implemented. 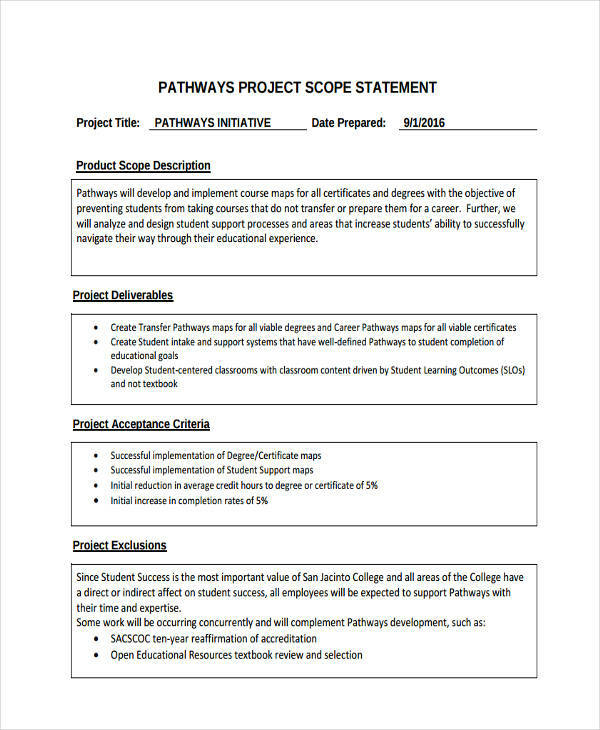 The project scope, including the limitation.